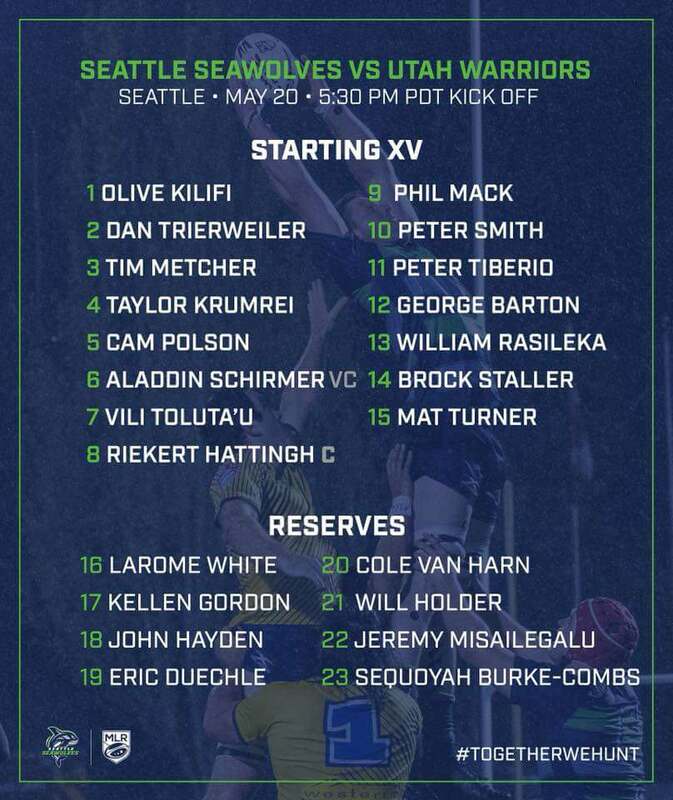 The Seattle Seawolves welcomed the Utah Warriors to the Pacific Northwest. Utah started strong but faded as the match wore on. Seattle started slow, picked up the paced, and finished fast to give themselves sole possession of second place in the standings. The Warriors got the scoring started early off a driving maul. Seattle was called for kicking the ball out of the ruck. Utah kicked to touch and mauled their way over for the try, with Lote Tu'ipulotu being the man to dot down for the try. Kurt Morath gave the Warriors an 8-0 lead with a penalty kick after the Seawolves were called for offsides. William Rasileka responded for the Seawolves. After a Kurt Morath clearance kick didn't find touch, Peter Tiberio was able to weave his way through the Warriors defense before being brought down. Rasileka was there for the clean up try. Mat Turner added a second try in two minutes for Seattle. George Barton found himself in space and offloaded to Turner who was clear in for the try. Utah responded back with a cheeky lineout play. 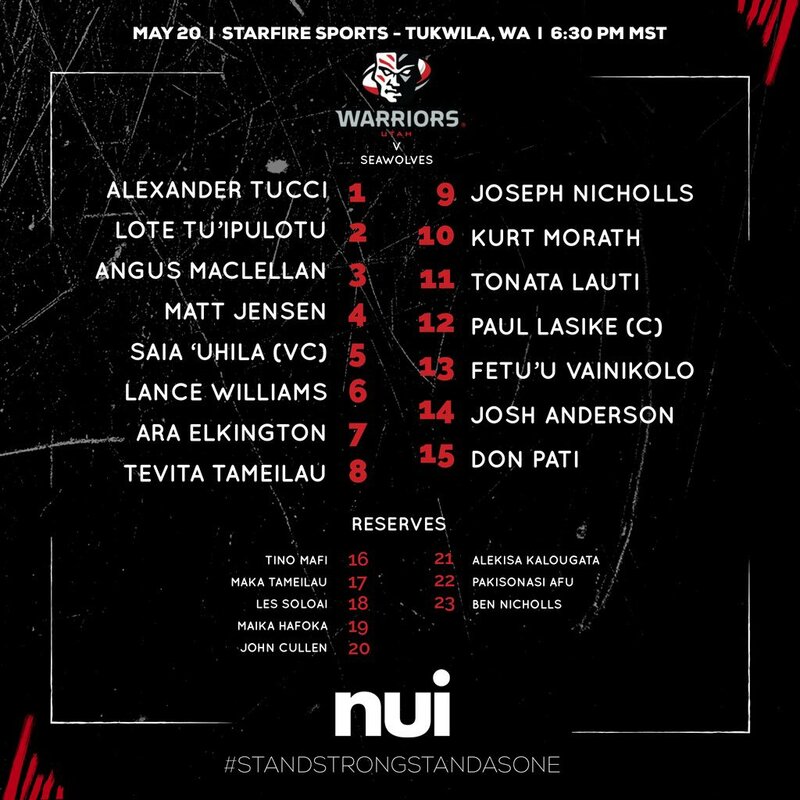 The Warriors faked the maul and had Lance Williams wrap around and offload to Tu'ipulotu for his second try of the day. Seattle's defense showed up in a big way in the first half. Utah went through multiple phases inside Seattle's 22 meter line. Utah had 30+ phases and Seattle held strong before they were able to force a turnover. Peter Smith added a penalty kick for the Seawolves to give them a four point lead after the defensive stand. Vili Toluta'u added another try for Seattle. After Utah was called for not releasing, Vili quick tapped from five meters out and powered over for the try. Tonata Lauti responded for the Warriors. After the Warriors broke through the Seawolves defense, Lauti received an offload from Alexander Tucci and weaved his way through the defense for the try. Brock Staller extend the Seawolves lead back to a converted try, 27-20, with a penalty kick. The Warriors looked for points at the end of the half, but a knock on stopped them in their tracks. This was a good, fast-paced first half from both sides. Both teams had defensive lapses and good offensive awareness. The Warriors started going to flat ball play and that looked to have cost them some opportunities. The Seawolves defense was big for them in the first half. Seattle spoiled an opportunity for Utah. They turned it over and Seattle quickly went down the field, where Phil Mack pushed his way over the line for the try. The Seawolves continued to put their foot on the gas. Vili Toluta'u picked up his second try of the match after forcing his way over the try line. Brock Staller added the conversion to give the Seawolves a 41-20 lead. Ara Elkington gave the Warriors a glimpse of life. Paul Lasike was running onto the pass and broke through the Seattle defense. Lasike offloaded to Elkington who finished off the play. Pakisonasi Afu added a second unanswered try for the Warriors. He took an overthrown Seawolves lineout and went in next to the posts. Seattle was able to shut down any hope of a closer score for the Warriors. The Seawolves were able to force a turnover on the restart. They went through multiple phases looking to add to their score, before they knocked on in injury time to bring an end to the match. Utah will surely be disappointed with this match. They had multiple scoring chances taken away by handling errors. They didn't play enough team ball. When they were playing well on offense, the Warriors had support and played together as a team. They also did worse when playing flat. Utah didn't throw enough passes to players running onto the ball as they had multiple tries and scoring chances they were directly caused by running onto the pass. Seattle will be happy with the victory in front of a sold out crowd. This was a fast paced match, that seemed to suit the Seawolves well. Seattle will walk away happy with their defense. They played a bend not break strategy that worked well for them. They stopped multiple Utah chances deep in their own territory. They had issues that they will need to work on. Their lineout is one of those. They gave too many opportunities to Utah with missed throws in the lineout. Utah has a short week as they head to Houston to take on the Sabercats on Saturday, May 26th. Seattle returns next Sunday, May 27th as they welcome NOLA Gold to the Pacific Northwest.